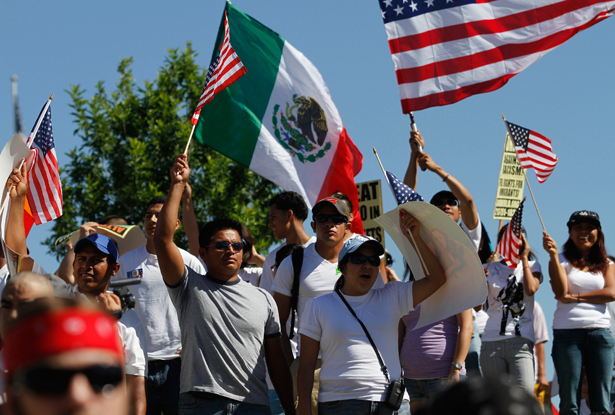 Just because the Hispanic population is growing doesn't necessarily mean Democrats will harvest their votes forever—for what if they become “white”? In February, I wrote the first part in a promised series about why today’s political conventional wisdom—that, as Jonathan Chait put it “conservative America will soon come to be dominated, in a semi-permanent fashion, by an ascendant Democratic coalition hostile to its outlook and interests”—may be premature. I cleared the decks by pointing to all those other moments—in 1964, 1972, 1974 (and, I didn’t note, 1992)—when equally confident prognostications of permanent Democratic majorities came a cropper. This time, I take on the most conspicuous this-time-it’s-going-to-be different argument: that the white vote in presidential elections has gone from almost 90 percent in 1980 to about 70 percent in 2012; that there are 24 million Hispanics currently eligible to vote and there will be 40 million by 2030; and that only 27 percent of Hispanic voters chose Mitt Romney for president (chart here)—and so, abracadabra, Democrats Über Alles! Now, it might hard for us to wrap our minds around a different way of seeing things in these days of Joe Arpaeio and Jan Brewer—and Susana Martinez, the Latina governor of New Mexico who promises to repeal her state’s law allowing undocumented immigrants to get driver’s licenses even though her own grandparents were undocumented immigrants. But, taking the long view—and isn’t that the whole point of this exercise?—it has to be acknowledged: party identities aren’t passed on through the genes. Blocs of “natural Democrats” have become natural Republicans before. Indeed, in at least one instance, it happened with shocking rapidity. As I noted last time, in the 1960s, droves of white Democrat ethnics—Italians, Eastern Europeans, the Irish—started voting Republican in a backlash against the Democrats’ continued embrace of civil rights in the wake of a failed open housing bill and the urban riots. Only an eye-blink earlier, they had been considered the soul of the New Deal coalition. Not Jews, of course; they stayed Democratic—even as they joined the Italians, Eastern Europeans and Irish in moving out to the suburbs. And so: consider an interesting bon mot I once heard in a speech by David Brooks (not ordinarily much of a sage, I’ll admit). He said the question going forward for the Republican Party was whether Hispanics would turn out to be Italians or Jews. That was in 2005, one of those brief windows when the “Italian Option” seemed like it just might be a possibility. A series of Bush Administration-supported bills for comprehensive immigration reform, including a path to citizenship for undocumented immigrants, were introduced. The next year, Bush boldly distanced himself from nativists in his party by calling the armed civilian border-patrollers of the Minutemen “vigilantes” even as other GOP pols were embracing them as citizen heroes, no more threatening than neighborhood watch volunteers (these were those long-ago days back before Trayvon Martin and George Zimmerman…). Then, in 2007, an armada of braying callers spurred by hysterical right-wing talk-jocks like Rush Limbaugh drove the nail in the coffin for Karl Rove’s dream to make the Republican Party safe for migrants from Mexico. And suddenly, over just about any imaginable time frame, it seemed Hispanics would be like Jews—Democratic loyalists, possibly forever. But look at the lead headline in today’s New York Times: “GOP Opposition on Migrant Law Seems to Erode.” (The lead example is no less a Tea Party darling than Rand Paul.) The RNC’s blockbuster save-the-party report released this week implores, “We must embrace and champion comprehensive immigration reform. If we do not, our party’s appeal will continue to shrink to its core constituencies only.” They actually seem serious about it this time. Admittedly, nobody ever went broke betting against the Grand Old Party’s stubborn insistence never to venture beyond its core constituencies, but: What if? What if a genuine immigration reform law happens? The very existence of a more immigrant-friendly Republican Party, meanwhile, might do much to assuage the sort of mainstream, moderate white voters who identify themselves by their tolerance (many of them quite conservative on economic issues) that it is now “safe” to vote Republican. Unlikely, you say: conservatives require an enemy to fear, an “Other” to hate, and those scary dark people from the crime-ridden wasteland on our southern border are “Others” par excellence. But, as I’ve been pointing out, for the conservative mind, enemies are fungible. So are fears. Conservatives did just fine transforming Martin Luther King from Satan himself into Santa Claus in the space of a couple of decades. Surely, a couple of decades from now, they’ll manage to find some other, less electorally powerful object to fear. And the party’s political fortunes might stabilize accordingly. That’s what I’ll be writing about next time in this series: the fungibility, and unpredictability, of fears, and how that may well provide Republicans a certain electoral advantage in the future whatever demographic changes come down the pike. Rick Perlstein explains that there is a conservative wing of the Democratic Party, and why progressives should recognize that fact.